LBA Technology™ capabilities include RF and video transmission design, integration and supply of systems, components and test equipment for broadcast radio, digital TV, telecoms and industry worldwide since 1963. You will find our products at leading radio and TV broadcasters, video studios, cable TV systems, satellite facilities, military establishments, laboratories and institutions. 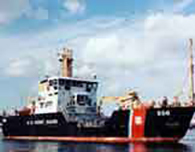 Our staff has a rich tradition of creating innovative solutions for our customers. Here you will find a brief discussion of the LBA Technology™ core offerings, and an extensive photo gallery with links to the relevant technology pages for your browsing convenience. Please feel free to contact us 24/7 for quick response to your questions. LBA Technology™ is your premier source for an expanding selection of world renowned test equipment. Our equipment supports digital broadcast TV, satellite, radio, antenna testing, EMC and R&D labs, and more. RF test equipment by LBA and our represented manufacturers is backed by more than 50 years of global LBA broadcast, wireless and Electromagnetic Compatibility experience. LBA is a leading supplier of RF shielding systems, materials and services. EMFaraCage® faraday cages are custom electromagnetic shielding enclosures. These portable shielding systems are effective against RF, EMI, EMF, and HEMP. Rugged, customizable, yet convenient, they can be used in labs, classroom, production test areas – anywhere a quiet electromagnetic environment is needed. We supply high performance RF shielding fabrics, paints, and components for professional installation. LBA supports turnkey room and whole building architectural RF shielding systems. Our specialists are available to perform RF interference site assessments and EMF surveys worldwide. We offer lightning protection services and products for broadcasting, wireless communications, utilities, fuels, and military assets, to name a few. Our products can protect structures such as antenna towers, windmills and wind farms, tanks, drill rigs, field camps, monitoring installations and many more. LBA Lightning Dissipator Arrays replace lightning rods on most towers and structures. A wide variety of lightning air terminals in the form of lightning dissipators (static dissipation arrays) replace conventional lightning rods in most applications. Rather than just terminating lightning strikes and subjecting towers and antennas to high lightning currents, dissipators are effective in preventing most strikes entirely. Lightning Mast Protection Systems offer area protection for fixed and portable assets. LBA’s patented PLP family of fixed and portable lightning protection masts and kits are based on light weight, rugged aluminum mast components which are sized for easy surface or air transport and rapid field installation. Installation is fast and easy. The PLP systems are designed for fast set up with only common tools. PLP lightning mast systems are proven worldwide. They are in use to protect well field pumps, mobile satellite dishes, USAF jet fighters, construction equipment, and more. LBA Technology™ specializes in providing radio broadcasting equipment for AM and DRM medium wave stations worldwide. We design, fabricate, and market radio frequency equipment to complement AM and medium wave transmitters and transmitting plants. 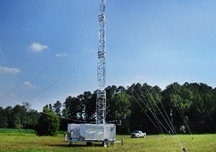 Our systems make AM radio towers and masts more effective and efficient. RF systems include antenna tuning units, multiplexers, transmitter combiners and directional array coupling systems for the medium frequency broadcast bands at power levels up to 1,000,000 watts. Our capabilities include broadband systems for IBOC and DRM digital broadcast modes. LBA RF parts and component support includes, power inductors, mica and vacuum capacitors, copper ground system components, meters, and more. Our RF broadcast equipment has been used for over 50 years by US and international broadcasters in thousands of omnidirectional and directional medium wave AM antenna systems around the world. Recognizing a need for readily transportable, easily deployable, and efficient radio transmitters and antenna mast systems, LBA has developed manpack and trailered medium wave AM radio systems. These are designed to fulfill emergency requirements, low power community AM broadcasting, and other missions. LBA Technology™ has pioneered in the integration of AM broadcasters into the cellular and wireless broadband world. Our proprietary CAMI® and ColoCoil® AM colocation isocoupler systems, as well as our ColoPole® folded unipole systems allow cellular and wireless broadband antennas on AM towers and masts. The proliferation of cellular towers has created a compatibility problem for AM broadcast stations. LBA detuning systems are an industry standard to negate the impact of nearby radio and power transmission towers on medium wave radiators and coverage patterns. LBA is a unique world source for high power RF components, such as RF inductors, mica and vacuum capacitors, vacuum contactors, and insulators. We are your factory store for Jennings and Comet vacuum capacitors. We supply all types of transmitters, radio towers, coaxial cable, copper grounding and lightning protection systems. LBA has a long history of providing solutions for users requiring efficient, broadband electrically short medium wave antennas. We provide such medium frequency transmitting antenna systems for navigation and location systems DGPS and NAVTEX, and for GMDSS shore transmitting stations. We make transportable MW transmitting stations for military and civilian use from man pack to C-130 flyable vehicles fielded by the US Army and British MOD. These systems have broad application in tactical and emergency communications, remote construction, and communications back.